Your brand-new home in the heart of Ward Village/ Kakaako/ Honolulu. Ocean, harbor, & Amenity deck views from the unit. This pet friendly home offers premium Bosch S/S appliances, Washer/ Dryer, Central AC, Hardwood floors, and a flexible floorplan. Enjoy World Class Resort amenities, 2-pools, hot tub, 7-BBQ Dining cabanas, Movie theater, state-of-the-art fitness gym, outdoor work-out area, yoga room, 4-"Grill & Go" station, 4- guest suites, Childrens Playground & Dog-Walk areas, Roof-Top Terrace, Massage room, Sauna Rooms, Steam Rooms, Media Room, Meeting room, Catering Kitchen, ample guest parking, Friendly concierge Front desk security, and VIP direct access to Hawaiis largest flagship WholeFoods. Great opportunity for this top-notch, well-built, modern, & brand-new luxurious home in Paradise. 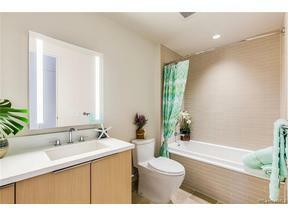 Best value in the building, lowest priced home in Ward Village!